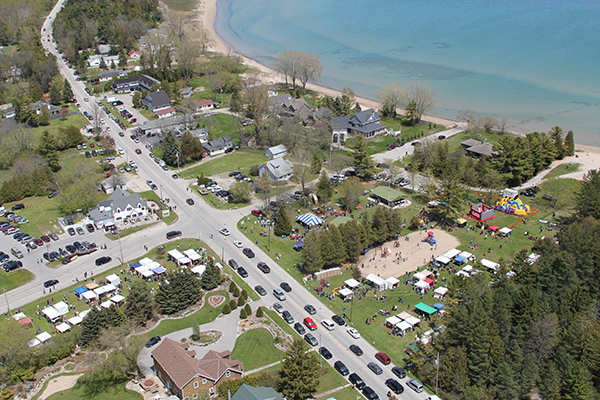 Spring comes to Door County with Jacksonport’s Maifest on Memorial Day Weekend! Maifest includes a juried art fair; midway activities for children; concession stands selling funnel cakes, kolaches, brats and hot dogs, and beverages. Enjoy live music both days. The Maifest parade is at 10:30 a.m. Saturday, a 10K run and 2-mile fun run at Lakeside Park on Sunday at 9 a.m.; the 4-H Horse and Pony Drill Team and Frontier Farmers horse pull at the ball field beginning at 1 p.m. Sunday. Maifest is sponsored by the Jacksonport Advancement Corporation. It includes multiple activities including a parade Saturday morning with Flag Ceremony honoring our servicemen and women following, children's activities, live music, horsepull, 10K and 2 mile fun run, a variety of food and beverages, and of course, the Art Fair. Both the 10k and 2 mile races start and finish at Lakeside Park located on beautiful Lake Michigan. The 2 mile is an out and back course along Highway 57 and Lake Shore Rd. With a quick and scenic course, this is perfect for the competitive runner as well as walkers, leisurely joggers, families and kids. The 10k race treks along N Cave Point Dr to the turnaround point at the waters of Clark Lake and returns along Lake Shore Rd. The race includes a t-shirt (guaranteed to pre-registered), chip-timing and same day results. Enjoy the quiet, serene beauty of Jacksonport on either route you choose to take! All proceeds go to community projects-we thank you for your support! T­-shirts guaranteed to all runners pre­registered. First come, first serve for day of registration. 10 K ­ Medals for 1st, 2nd and 3rd places in each age division, and Male/Female 1st, 2nd, and 3rd overall. 2 Mile Walk/Run ­ Medals to 1st, 2nd and 3rd overall Male & Female. Saturday, May 25th noon to 4pm, and Sunday 7:00-8:30 A.M. at the Jacksonport Park. Parade Participant Information: Questions on the parade can be directed to Ken Honold at (920) 823-2179 after 6PM. Volunteer Information: We couldn't put on Maifest without our volunteers. Just print the Volunteer Form, complete and return to Ann Sheridan at 6058 Lake Shore Road, Sturgeon Bay, WI 54235. Or you can call her at (920) 823-2068. Thank you.